The look of a full-wall-slideout model in a traditional design. The Aspire is Entegra Coach’s entry-level diesel pusher. 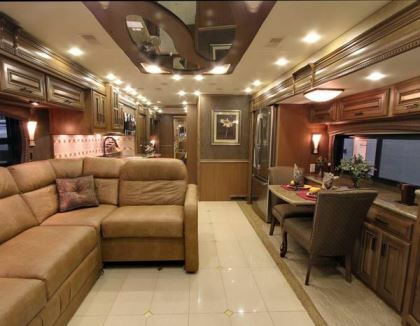 However, the term “entry-level” doesn’t accurately describe this beautiful motorhome. 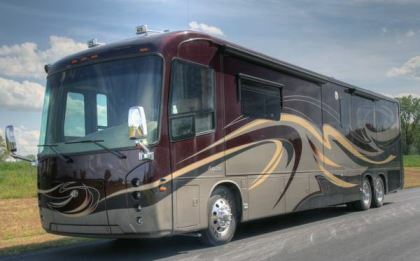 Laden with features and amenities, it rises well above most motorhomes defined by that term. Entegra Coach has committed to introducing floor plans on a regular basis and the latest, the 44B, is noteworthy. While 45-foot floor plans have been present in the company’s Anthem and Cornerstone lines, this marks the first 45-foot Aspire to be offered. The bath-and-a-half floor plan features a comfortable dining and living area and a spacious layout. The 44B is also available in Entegra Coach’s Anthem and Cornerstone models. Like every Entegra Coach motorhome, the Aspire 44B is built on a Spartan tag axle chassis. An 8.9-liter Cummins ISL engine produces 450 horsepower and 1,250 pound-feet of torque and is cooled via a side radiator. The Mountain Master raised-rail chassis with air-ride suspension is fitted with a front I-beam axle with air disc brakes, while the rear and tag axles are equipped with large drum brakes. Entegra Coach’s exclusive X-bridge construction further strengthens the chassis to provide minimal flex and a smooth, stable ride. With a 46,600-pound gross vehicle weight rating (GVWR) and 10,205 pounds of occupant and cargo carrying capacity (OCCC), the Aspire is easily capable of handling motorhomers’ storage needs. The 15,000-pound hitch and 61,600-pound gross combination weight rating (GCWR) ensures that most anything you want to tow also can be accommodated. Equalizer Systems dual-acting hydraulic leveling jacks provide stabilization of the coach when parked. The dual-acting jacks ensure positive jack retraction rather than relying on springs, resulting in faster retraction times, especially in cold weather. Unlike most coach manufacturers, Entegra Coach employs hung wall construction in the build process. It differs from vacubonded walls in that the aluminum structural framework is welded first, then mounted to the coach. Plywood is fastened to the interior of the wall and the wall is bolted through the coach floor. At this point a reflective waffle-weave Flexfoil insulation barrier is secured to the interior wall, followed by batten-style fiberglass insulation. The external fiberglass skin is then hung and fastened to the aluminum framing. This construction method results in a solid wall with excellent insulation values and an extremely smooth surface on which to apply exterior paint. Entegra Coach also incorporates a 2-inch-by-4-inch wood floor structure over the steel subfloor framing. The framing, covered with 3/4-inch plywood, helps to isolate road vibration and noise during travel. Batten-style insulation is fitted into the floor, resulting in an amazing R-33 value. A hydronic heating loop is also located in the floor to warm the tile in cool weather. The one-piece fiberglass roof is supported by aluminum trusses. Roof decking is a generous 3/8-inch plywood. These elements, plus batten-style fiberglass insulation and a vinyl padded ceiling, yield a composite roof value of R-24. A steel hoop over the cockpit area provides additional strength, rigidity, and safety. Entegra Coach’s exteriors are among the most attractive of all Type A motorhomes, in my estimation, and the Golden Garnet exterior on this test coach was no exception. The basic color coats are sanded up to 2,000 grit, then covered with three polyurethane clear coats, bringing an attractive depth to the finish. The final clear coat is sanded and buffed to a mirrorlike shine and baked in a curing oven for maximum durability. The basement compartment doors are side-hinged, resulting in plenty of height for access into the cargo storage bays. Gas struts on the doors hold them in place when opened. The Aspire has 20 inches of clearance from the basement floor to the bottom of the frame rails to allow large, bulky objects to easily pass beneath the rails. Carefree power awnings for the patio area as well as the entry door are armored, as are all of the slideout toppers. The flush-mounted windows, also covered by armored window awnings, offer a smooth, streamlined appearance. Power entry door locks and the keyless entry can be accessed via the keypad imbedded in the entry door assist handle or with a remote key fob. The wide entry door is equipped with a pneumatic tensioning cylinder to pull the door tight during travel. This cylinder automatically deploys whenever the parking brake is released and holds the door tight against the frame to eliminate any whistling or air leaks when driving. As soon as the parking brake is applied, this cylinder releases and the door can be unlocked and opened with ease. The 44B floor plan incorporates a number of new design ideas. For one, it has the look and roominess of a full-wall-slideout motorhome yet still has that support column that gives the strength of a traditional quad-slide layout. Entegra Coach designers engineered this by routing the galley plumbing lines through the deep wooden floor substructure rather than into a large wall enclosure. This allows for the use of a much smaller wall area with minimal depth, rather than the typical deep cabinet section that handles the slideout plumbing connections. A comfortable, L-shaped couch is placed in the curbside slideout. An extension in the sofa can be utilized for additional seating capacity or retracted to open up the aisle during transport. The driver’s-side slideout contains an angled cabinet that holds an optional electric fireplace, which adds ambience and takes the chill off on cool evenings. Mounted to the top of the cabinet is a large 50-inch LED TV screen, while the surround sound system and DVD player are located in the compartments beneath. A recliner chair is situated next to the cabinet and can be placed anywhere in the living area. When the slides are retracted for travel, the coach seems roomier than many; plus its wide aisle permits access to the guest bath while traveling. The galley work area is equipped with a Corian brand solid-surface countertop with a raised step at the rear, backed by a decorative porcelain tile backsplash with inlays. A pull-out work area equipped with spacious drawers and heavy-duty ball bearing slides extends to create additional work space. The galley is equipped with a recessed dual-basin sink and an Amana three-burner cooktop with removable Corian covers. A microwave-convection oven is installed into the overhead cabinetry with an exhaust fan vented to the exterior. A handy two-layer silverware drawer maximizes storage, and a large pullout tray provides space for a trash can and storage for the sink covers. Directly opposite the galley is a 23-cubic-foot Whirlpool stainless-steel residential refrigerator with a large pull-out freezer drawer and an in-door ice and water dispenser. The extendable dinette table is fitted with a wide Corian-topped buffet with cabinets that can be used for storage or as a computer workstation. The polished porcelain tile floor accents the cabinetry and woodwork throughout the Aspire. Amish craftsmanship is evident, from the mitered-corner raised-panel cabinet doors to the hardwoods used in creating this attractive environment. The test coach featured the Cabernet interior décor package and Tuscan Glazed Maple woodwork. 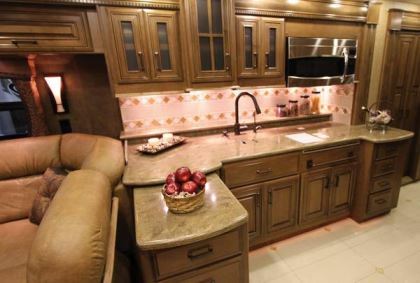 A padded soft-touch vinyl ceiling contained recessed LED lighting for a warm, pleasing look, as well as air-conditioner ducts, which were distributed throughout the motorhome for even airflow. Flexsteel Ultraleather furniture is used throughout the coach with the exception of the L-shaped couch, which is made by Williamsburg. A multiplex wiring system controls the interior lighting as well as the power day-night cockpit window shades. The guest bathroom is equipped with a Corian-topped vanity with recessed sink. A mirrored medicine cabinet directly above is flanked by a mirrored side cabinet that contains the tank monitoring system, HVAC controls, and 12-volt fuses. A porcelain bowl pedal-flush toilet and vented fan finish the guest bath. Across the hall from this bath area is a large full-height cabinet capable of storing anything from bedding to cookware. The Aspire’s rear bedroom is equipped with a king-size bed topped by a Select Comfort air mattress. Multiplex wiring controls for the lighting are built into the bottom of the large storage cabinets over the bed. In the slideout at the foot of the bed is a full-width dresser filled with drawers. A 32-inch LED TV is placed in the upper section, flanked by additional storage cabinets. Raised-panel sliding hardwood doors separate the bedroom area from the rear bath as well as the front of the coach. The bedroom TV is mounted on hinges to allow easy access to the DVD player or a second satellite receiver, which would be located behind the TV to maximize storage space. The porcelain tile floor is also warmed via the Aqua-Hot hydronic heating system. The Aspire’s master bath, at the very rear of the coach, features a three-quarter-width wardrobe with an adjacent set of louvered doors that conceal the standard stackable washer-dryer ensemble. A custom-cut rug covers the porcelain tile floor and can be removed if desired. A circular shower surround features rippled glass to hide water spots and minimize cleaning. A porcelain bowl macerator-style toilet pumps waste forward to the black holding tank. The bathroom vanity is also finished with a Corian top and contains a single oversized recessed sink basin. A full-width mirror is inserted into an ornate wooden frame but does not have a medicine cabinet. An exhaust fan is mounted into the soft-touch vinyl ceiling, which also contains recessed LED lighting. The cockpit area is efficiently organized. The white-faced instrumentation is set into wood burl dash panels and easily can be seen through the steering wheel when driving. The transmission control panel and parking brake knob are located in the dash immediately to the right of the Smart Wheel steering wheel. The rear- and side-view camera monitor, the Rand McNally GPS navigation and entertainment system, dash heat and air controls, and the generator start-stop switch are all located in the dash above the center console. Controls for the lights and Equalizer Systems automatic levelers are located to the left of the steering wheel. The Flexsteel six-way cockpit seats are very comfortable and include seatbelts and shoulder harnesses that are integrated into the backrest for ease of use. The copilot’s seat is equipped with an extendable power footrest. Full-width power sun and privacy shades provide sunlight shading when driving, or privacy when parked. Cabinets on the sidewalls contain the various controls that operate the slideouts, the Magnum true sine wave inverter, the Onan EC-30 automatic generator start system, TV antenna, awnings, and other accessories. The Aspire provides plenty of spacious basement storage. The forwardmost bay is fitted with a full-width, dual-acting cargo slide tray, which slightly reduces the 20-inch height clearance but makes it easy to access cargo. The water pump and full-house water filter are conveniently located on a warm interior wall at the rear of the large pass-through basement storage area. A bank of four batteries is located on an easily accessible slide-out tray in a forward compartment near the entry door. The boiler for the Aqua Hot 375-LP hydronic heating system is positioned in a passenger-side compartment. The Aspire differs from its Anthem and Cornerstone cousins, which use diesel-powered Aqua Hot systems, in that the 375-LP is powered by propane. This clean-burning system provides instant on-demand hot water and hydronic heat, just like the more expensive diesel-burner models. We’ve also learned the Aspire will be moving to the redesigned and more user-friendly 400-LP model. The 50-amp power cord is mounted on a power rewind cord reel in the same compartment as the Aqua-Hot. Additional power is provided by a Magnum 2,800-watt true sine wave inverter-charger placed in the basement area and an Onan 10,000-watt Quiet Diesel generator located on slideout rails in the front cap. A 50-gallon propane tank powers the cooktop as well as the hydronic heating system and is accessed via an open-air forward compartment on the driver’s side. A storage tube also is located in that bay for the sewer hose to keep it separate from the fresh water area. The spacious plumbing service bay is located aft, where a power rewind hose reel and a remote shower attachment are situated. Tank levels can be monitored by either one of two SeeLevel panels in the coach interior or basement utility bay. At the right rear corner of the motorhome, a handy service bay provides easy access to the engine start batteries, the air dryer, the electronic control module, and fuel filters. The 13-gallon DEF tank is also located behind this large door but can be accessed by a smaller door within a door for easy refueling in a narrow refueling station. The Aspire 44B exhibits great handling and a comfortable ride. The X-bracing and other chassis modifications that Entegra Coach adds to the already great Spartan chassis help to keep the superstructure solid. The thick wooden floor trusses and R-33 insulation over the steel subframe help to dampen vibrations and isolate road noise, resulting in a very smooth, quiet ride. Polar pack insulation with reflective Flexfoil in the walls and roof further quiet the coach. The Cummins ISL engine easily moved the coach with plentiful power, and the brakes and engine compression brake allowed for respectable stops for a coach of this size. While the Aspire does not have independent front suspension like its bigger siblings, the solid I-beam front axle still gave a great ride. The Aspire’s rolled dash and extra-deep windshield offered excellent visibility during tight maneuvers, and the lower side mirror positions provided optimal viewing angles to eliminate any blind spots caused by higher-mounted mirrors. When you factor in the performance, the quality of construction, the appearance, and the price, the Aspire is an exceptional value in its category. Alfa See Ya From Alfa Leisure Inc.